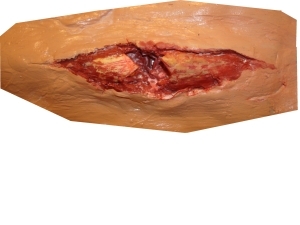 Creating reusable fake wounds for first aid practice is simple, inexpensive, and fun. 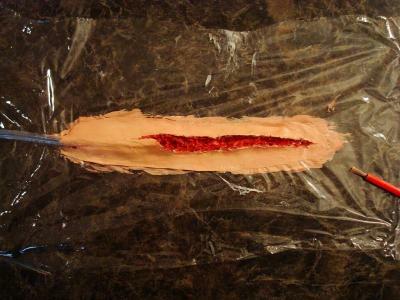 Lay out a sheet of plastic wrap. Squirt two strips of caulk side by side. 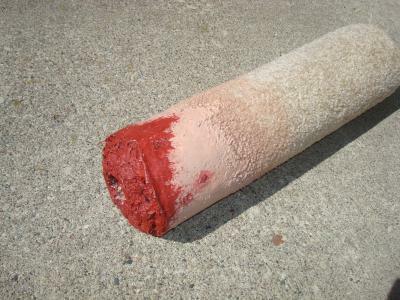 If including blood, lay a 6-inch piece of tubing between the caulk strips. 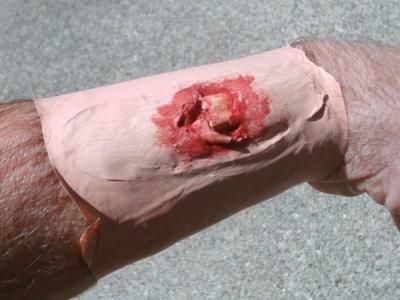 With a finger dipped in water, spread the caulk. 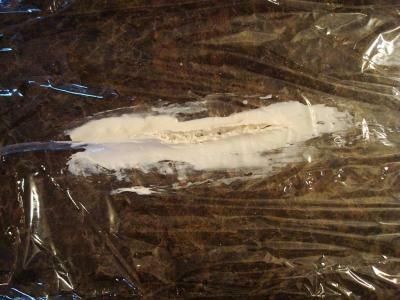 Feather it into the plastic wrap and push the two strips together to create a long mound. 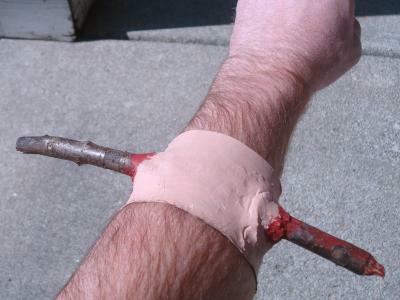 If using blood, cover the tubing. Smooth the caulk so there are no bumps or chunks. 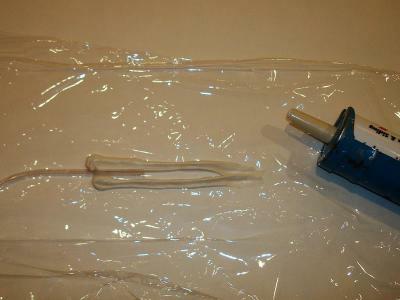 Allow the caulk to dry for an hour or more until it is no longer wet. 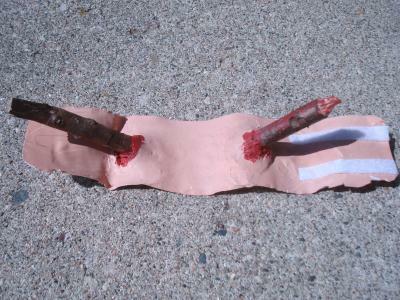 With a toothpick, add texture to the cut by pricking and pulling bits of the caulk along the cut line. Allow the caulk to thoroughly dry - at least overnight. 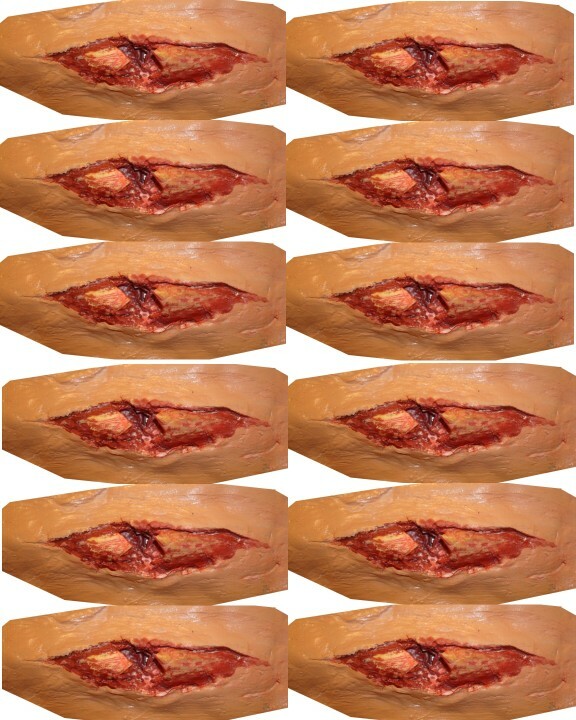 Paint the cut using the red paint. 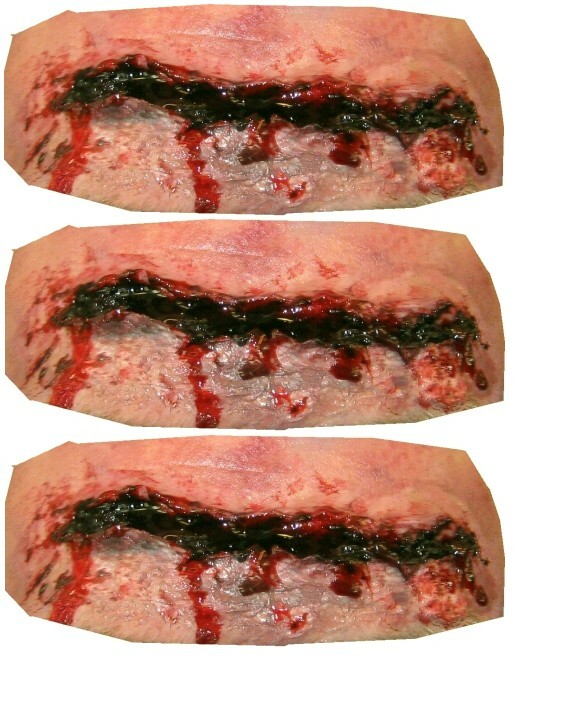 It's ok to get outside the cut, but be sure to cover the entire area inside the cut. 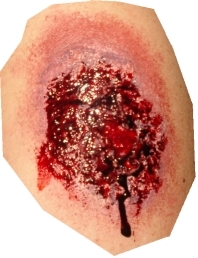 When dry, paint the entire wound up to the edge of the cut with flesh-colored paint. 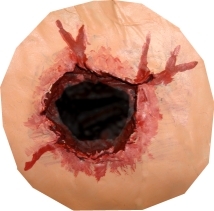 This is easiest because brushing towards the wound has a clean edge so you won't get flesh color inside the wound and you can cover the red paint that got on the skin. 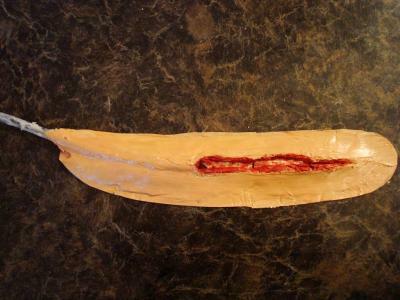 Cover the entire piece in flesh paint and let it dry. You may touch up small spots along the edge after the paint is completely dry. 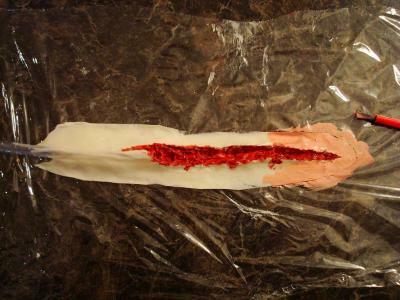 Once dry, use a scissor to cut the plastic wrap and trim the wound edge. Use two-sided tape to hold the wound onto the 'victim'. I found that using two-sided tape was fast and easy but would not stick as well as I'd like. 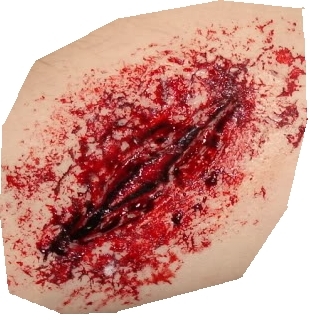 Another way to make the wounds is to spread the caulk into a thin layer over a long, wide strip of plastic wrap - long enough to wrap around the arm or leg. When dried, add strips of velcro - one perpendicular strip at the end of the backside and two parallel strips on the front of the other end. 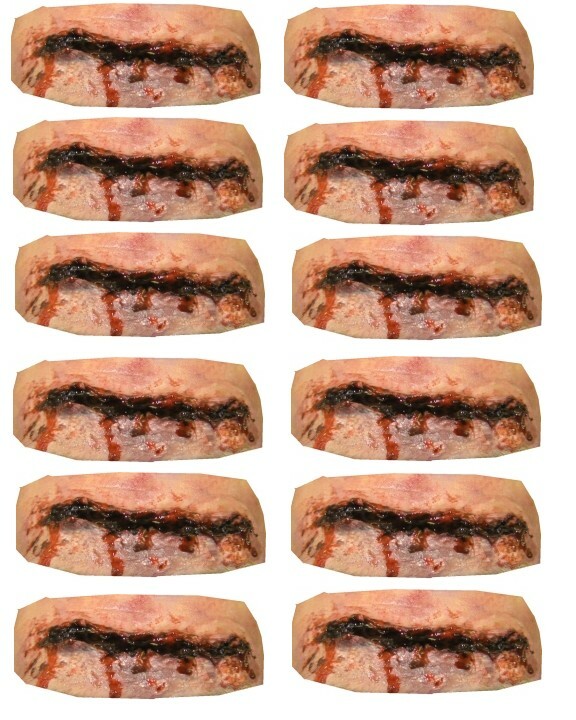 This allows an adjustable length. 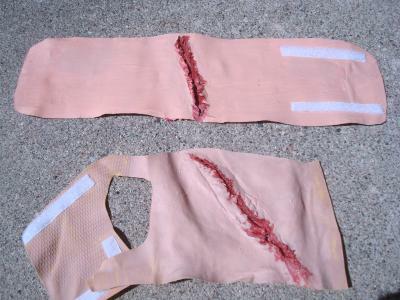 To increase strength and prevent tearing, add strips of duct tape to the back of the fake wound before sticking on the velcro. 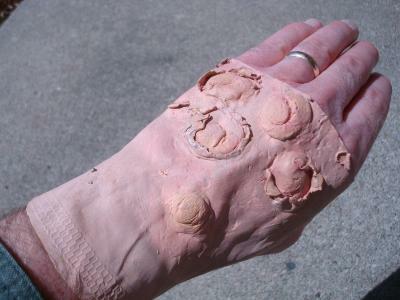 I also found that hand wounds can be made very nicely on dishwashing gloves. 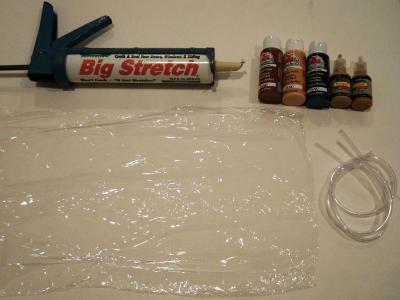 The paint will not stick to the gloves, so you must spread caulking all over the glove and let it dry first - then paint. 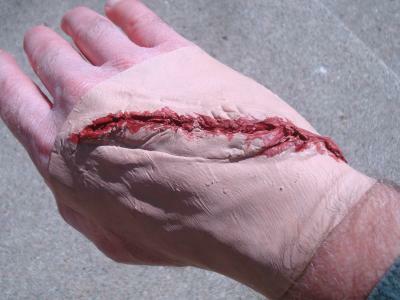 The simplest in fake wounds is to print a picture and tape it in place. 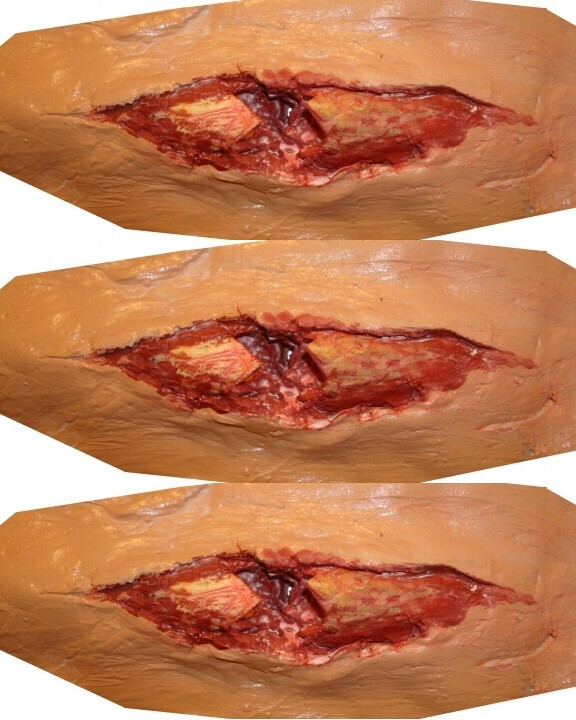 They aren't as interesting as moulage but work fine for indicating where a wound exists in first aid training.